Great Lakes, USA – The Great Lakes Surf Rescue Project (GLSRP) will continue to acknowledge and endorse the Michigan Sea Grant’s “Flip, Float, and Follow” rip current survival campaign in its 2013 “Water Safety Surf Rescue” classes. 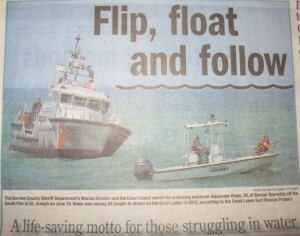 It will be presenting its version of Flip, Float, and Follow April 17th in Port Washington, Wisconsin. The Port Washington Waterfront Safety Advisory Committee in conjunction with the Greater Port Washington Kiwanis Club is organizing two GLSRP presentations. One will be at the high school and the other will be at the Port Washington-Saukville School District Aquatic Center at Thomas Jefferson Middle School. The Waterfront Safety Advisory Committee was created by a city mourning the Labor Day weekend drowning of teenager Tyler Buczek. The beach safety measures intend to prevent a repeat of the tragedy that broke the collective heart of the community. The presentations will also be part of the Kiwanis Club’s ‘Week of the Young Child’ program. Although the club’s ‘Week of the Young Child’ is typically geared toward kids between the ages of 4 and 9, the surf rescue program is open to people of all ages and will be of particular value to middle and high school-age youths because they are the ones most likely to frequent beaches without adult supervision, said Beckie Perez, who is also a Kiwanis Club member. “An ordered task like Flip, Float, and Follow can be an effective psychological tool that can be focused on in order to avoid panic in a terrifying situation,” said David Benjamin, GLSRP executive director. 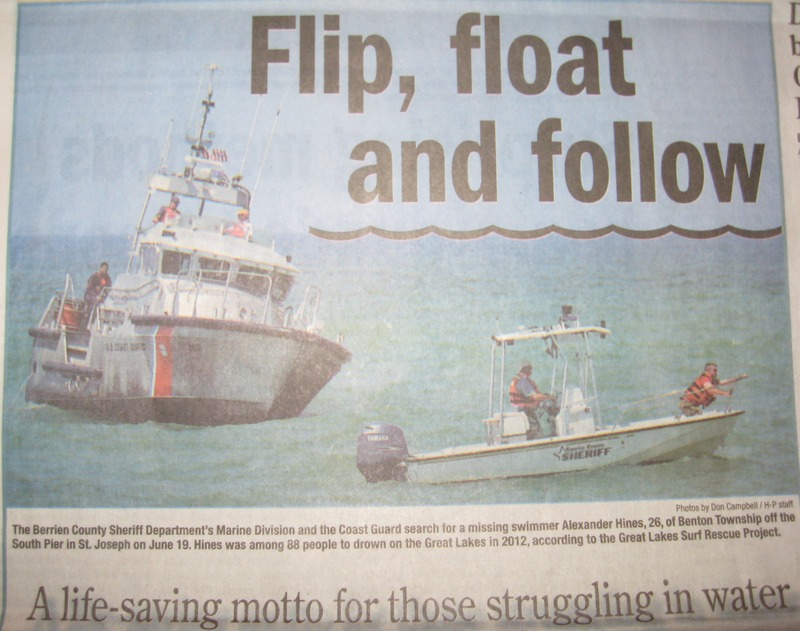 According to LaPorte, the Michigan Sea Grant’s “flip, float and follow” public outreach campaign is the result of input from a variety of first responders and water safety groups that participated in the Great Lakes Water Safety Conference, sponsored by Michigan Sea Grant in 2011. –As long as you are floating, you are alive (*cold water hypothermia may set in within one hour, so know the 1-10-1 Rule of Hypothermia, especially in spring, fall, and winter. ).